Download "THE ANGLO-AMERICAN SCHOOL OF MOSCOW. 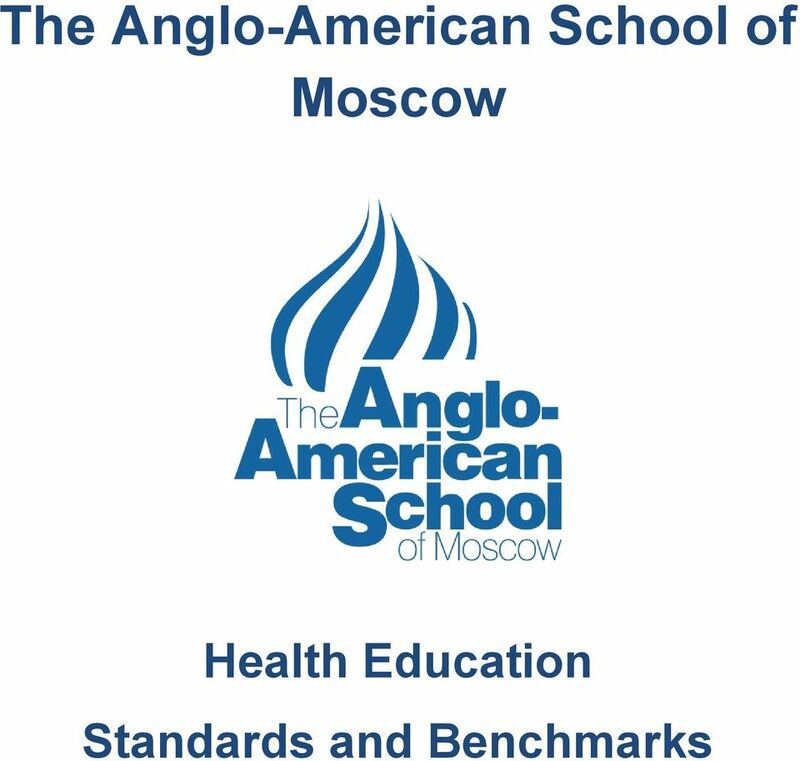 K-12 Health Education"
1 THE ANGLO-AMERICAN SCHOOL OF MOSCOW K-12 Health Education The Physical Education curriculum is designed to encourage a commitment to a lifelong healthy lifestyle. Our program promotes personal, social, intellectual, mental and physical well-being through a breadth of team-oriented and individual activities. Consistent participation in Physical Education enhances self-confidence, creativity, tolerance, selfesteem, leadership, body awareness and skills. 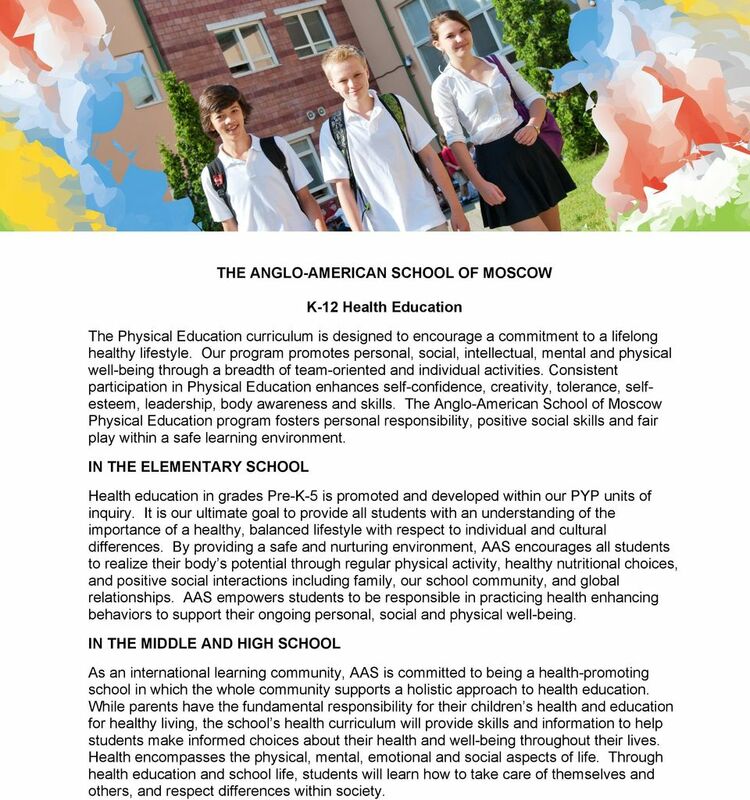 The Anglo-American School of Moscow Physical Education program fosters personal responsibility, positive social skills and fair play within a safe learning environment. 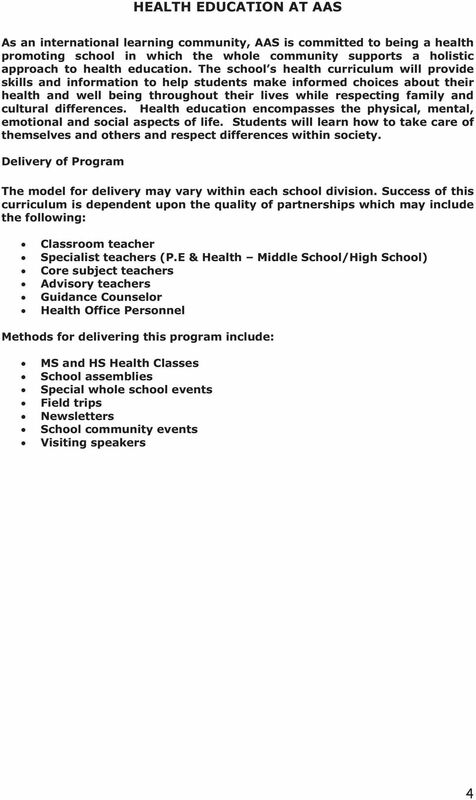 IN THE ELEMENTARY SCHOOL Health education in grades Pre-K-5 is promoted and developed within our PYP units of inquiry. It is our ultimate goal to provide all students with an understanding of the importance of a healthy, balanced lifestyle with respect to individual and cultural differences. By providing a safe and nurturing environment, AAS encourages all students to realize their body s potential through regular physical activity, healthy nutritional choices, and positive social interactions including family, our school community, and global relationships. 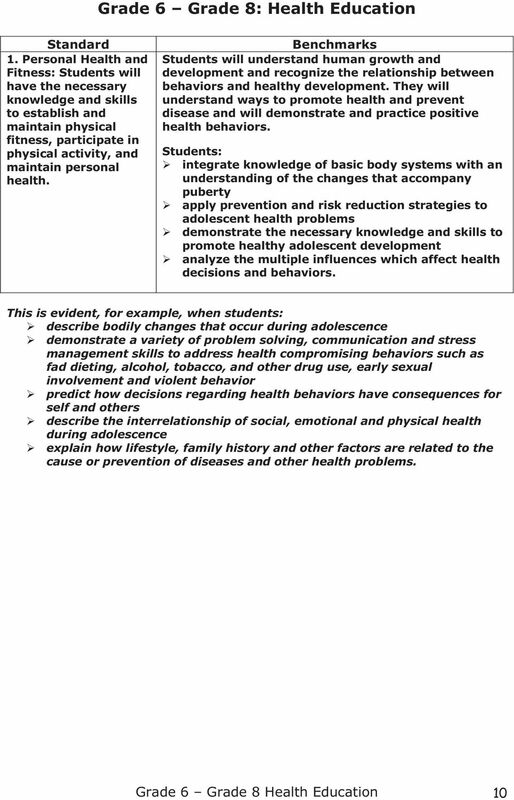 AAS empowers students to be responsible in practicing health enhancing behaviors to support their ongoing personal, social and physical well-being. 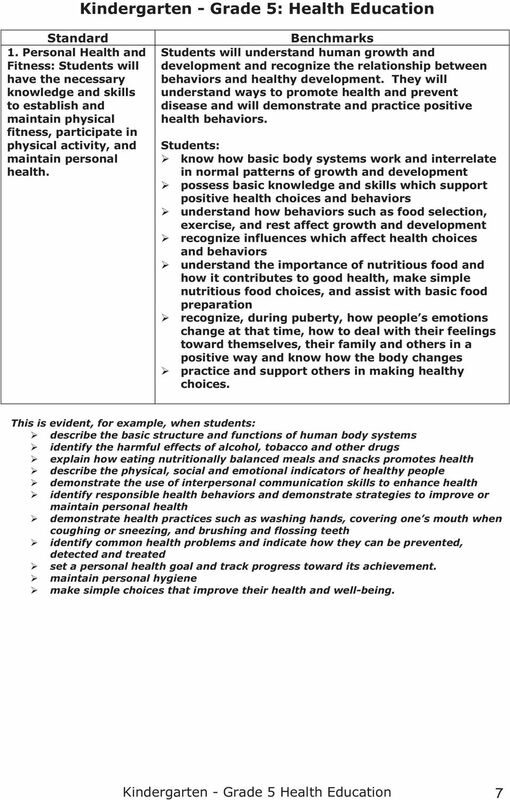 IN THE MIDDLE AND HIGH SCHOOL As an international learning community, AAS is committed to being a health-promoting school in which the whole community supports a holistic approach to health education. 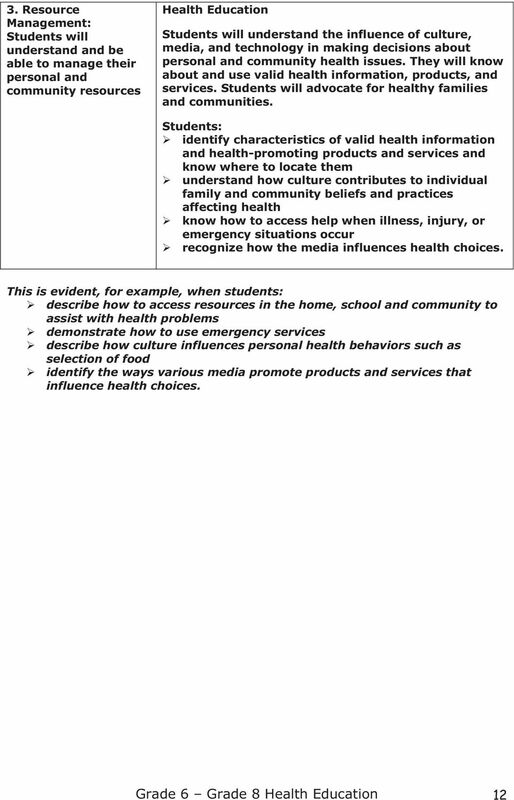 While parents have the fundamental responsibility for their children s health and education for healthy living, the school s health curriculum will provide skills and information to help students make informed choices about their health and well-being throughout their lives. Health encompasses the physical, mental, emotional and social aspects of life. 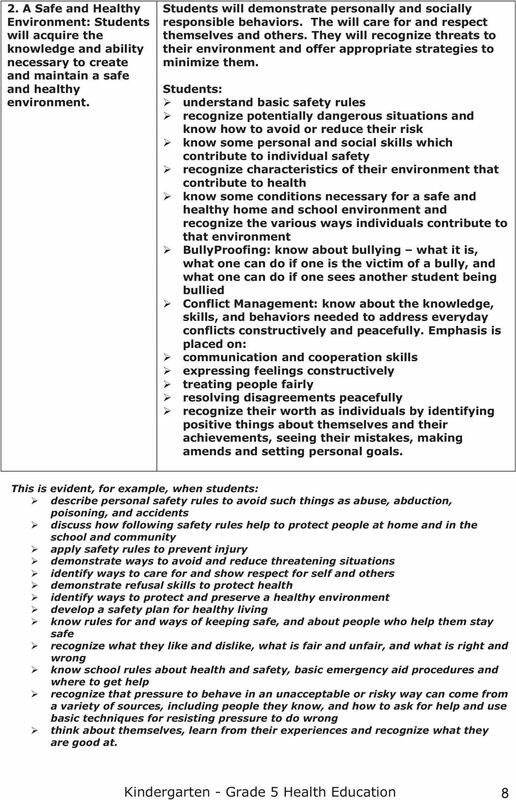 Through health education and school life, students will learn how to take care of themselves and others, and respect differences within society. 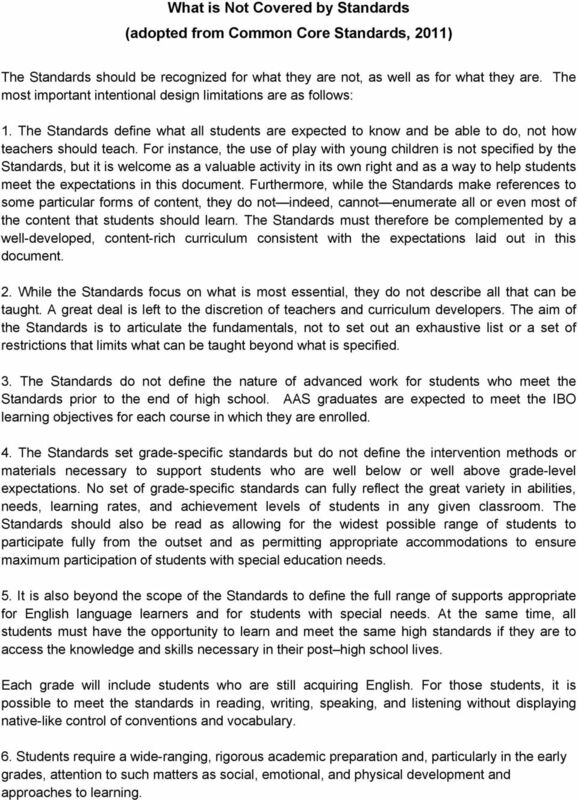 4 What is Not Covered by Standards (adopted from Common Core Standards, 2011) The Standards should be recognized for what they are not, as well as for what they are. The most important intentional design limitations are as follows: 1. 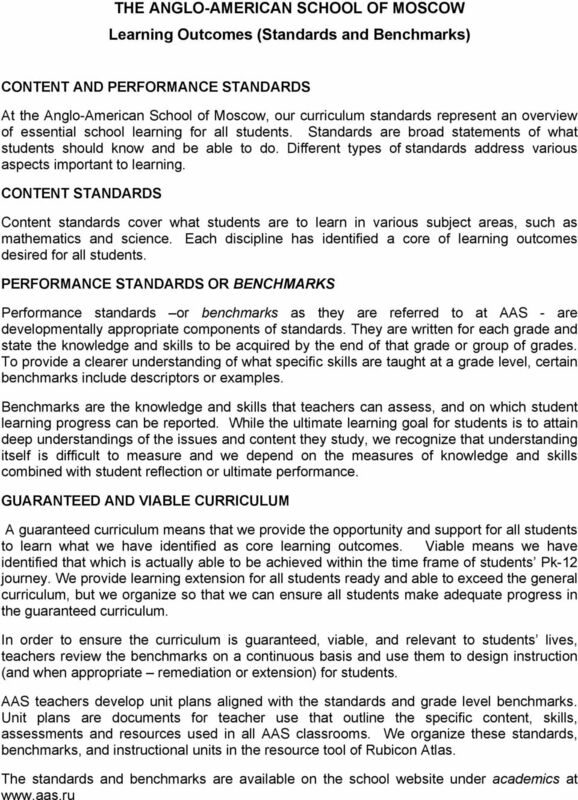 The Standards define what all students are expected to know and be able to do, not how teachers should teach. 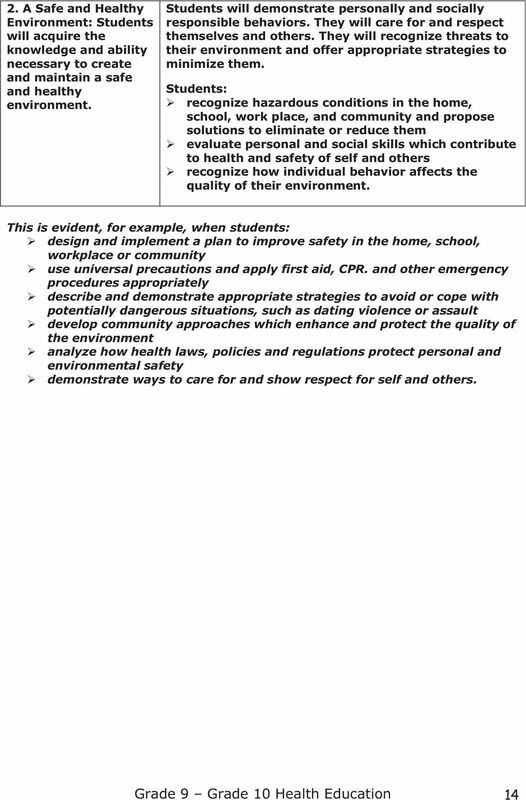 For instance, the use of play with young children is not specified by the Standards, but it is welcome as a valuable activity in its own right and as a way to help students meet the expectations in this document. Furthermore, while the Standards make references to some particular forms of content, they do not indeed, cannot enumerate all or even most of the content that students should learn. 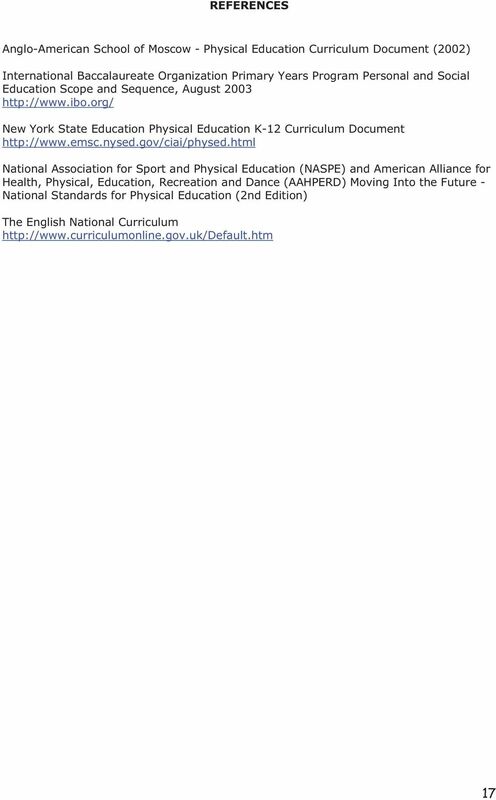 The Standards must therefore be complemented by a well-developed, content-rich curriculum consistent with the expectations laid out in this document. 2. While the Standards focus on what is most essential, they do not describe all that can be taught. A great deal is left to the discretion of teachers and curriculum developers. The aim of the Standards is to articulate the fundamentals, not to set out an exhaustive list or a set of restrictions that limits what can be taught beyond what is specified. 3. The Standards do not define the nature of advanced work for students who meet the Standards prior to the end of high school. 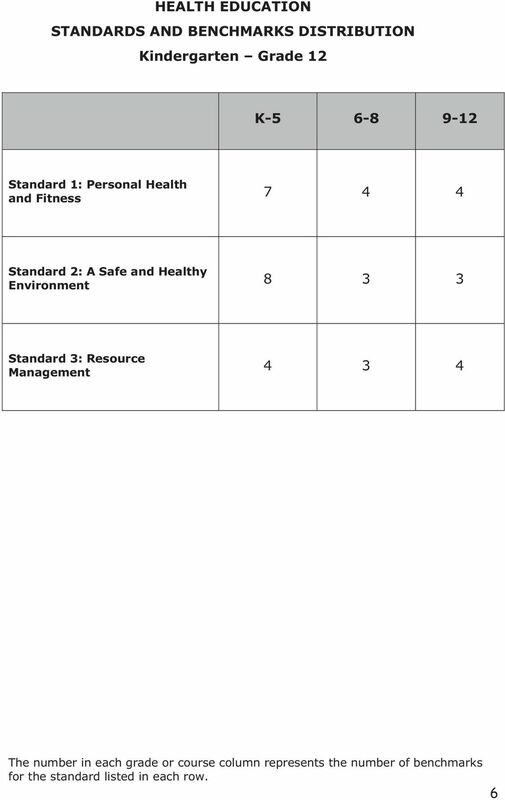 AAS graduates are expected to meet the IBO learning objectives for each course in which they are enrolled. 4. 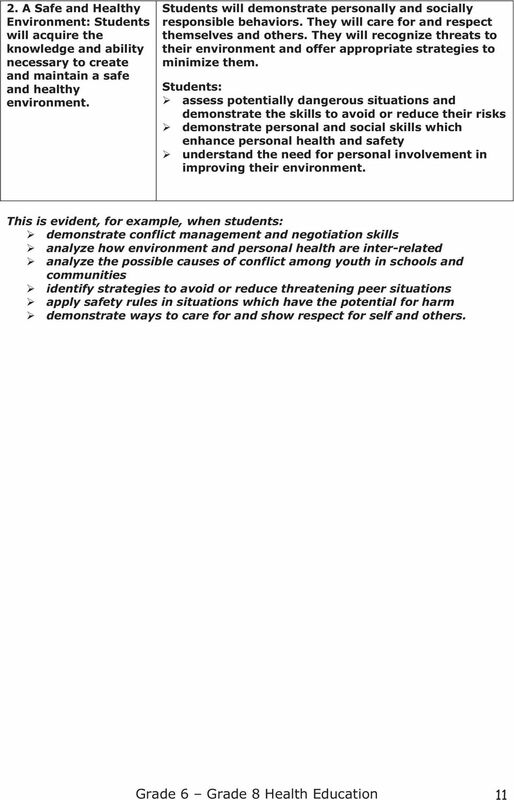 The Standards set grade-specific standards but do not define the intervention methods or materials necessary to support students who are well below or well above grade-level expectations. No set of grade-specific standards can fully reflect the great variety in abilities, needs, learning rates, and achievement levels of students in any given classroom. The Standards should also be read as allowing for the widest possible range of students to participate fully from the outset and as permitting appropriate accommodations to ensure maximum participation of students with special education needs. 5. It is also beyond the scope of the Standards to define the full range of supports appropriate for English language learners and for students with special needs. At the same time, all students must have the opportunity to learn and meet the same high standards if they are to access the knowledge and skills necessary in their post high school lives. Each grade will include students who are still acquiring English. For those students, it is possible to meet the standards in reading, writing, speaking, and listening without displaying native-like control of conventions and vocabulary. 6. Students require a wide-ranging, rigorous academic preparation and, particularly in the early grades, attention to such matters as social, emotional, and physical development and approaches to learning. 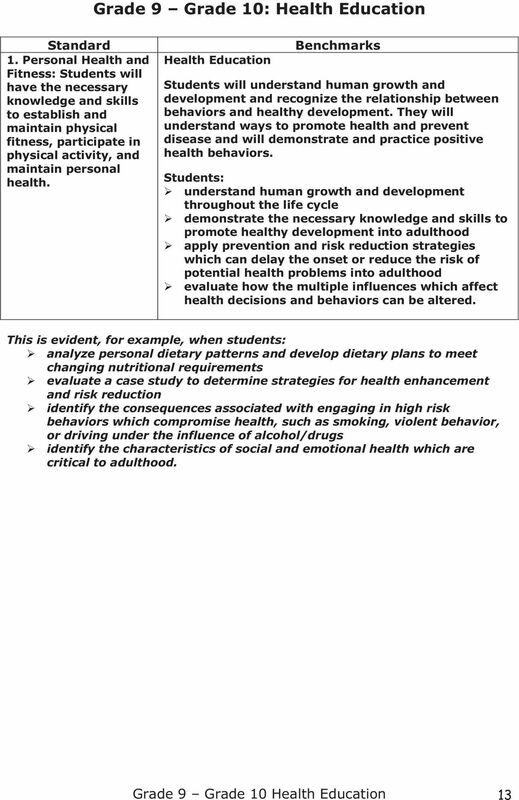 Content: Health-enhancing behaviors contribute to wellness. FIRST GRADE Students in first grade learn about their body s systems and various health topics. They begin to understand how their decisions can impact their health and well-being now and in the future. 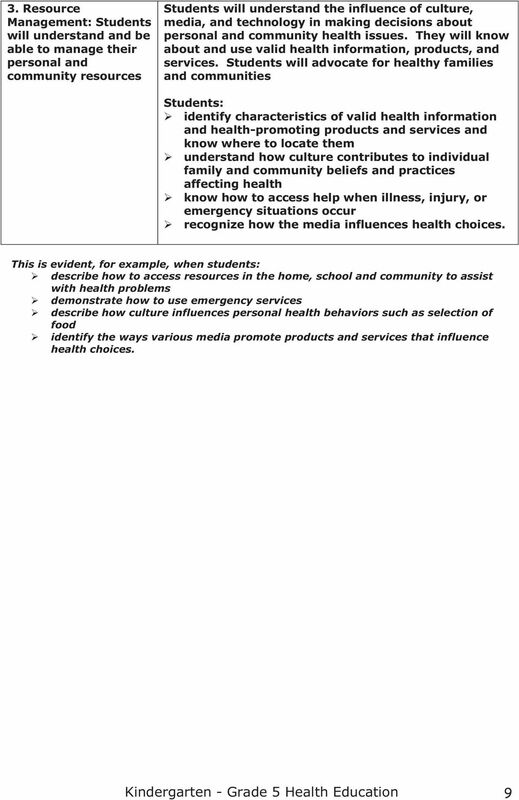 Grade 3 Health Education, Quarter 1, Unit 1 of 2. 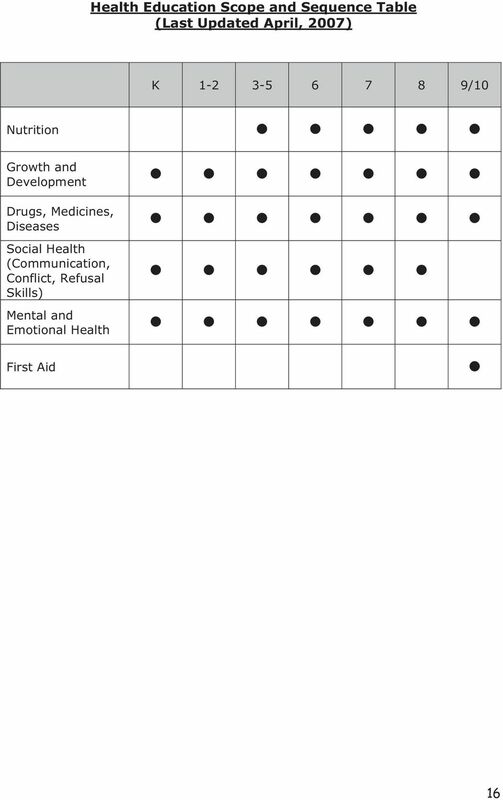 Mental and Emotional Health: Mental, Emotional, Family, and Social Health.